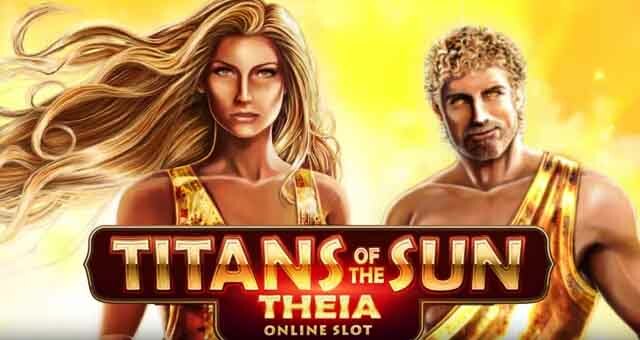 Titans of the Sun was the twin release of two slots by Microgaming in 2015. The two games are titled Hyperion and Theia and were some of the best online slots in their time. There are essentially two versions of the slot to choose from centered on ancient Greek Mythology characters Hyperion and Theia who are parents of the Sun God. The slot is jam-packed with bonuses including mega and mystery symbols and free spins. The game is played over 5 reel with 15 paylines. Symbols include mythical creatures Pegasus and Phoenix along with Hyperion and Theia and your usual A, K, Q, J symbols. The mystery symbol is depicted by the golden sun and after your spin this will automatically change at random to a low- or high-paying symbol which can easily help create a big win. Usually the mystery symbols come stacked. As an added bonus during free spins the mystery symbol can also transform into a wild. The mega symbols consist of a big block of symbols sometimes reaching a group of nine symbols of all the same character. This allows for awesome wins, especially if you are lucky enough to combine with a wild. This game is one of the first where Microgaming used its now common mega symbols, which have created a more exciting player experience. To hit the free spins you need three or more of the Gods Kissing scatter symbol. This wins 15 free spins with a 2x multiplier bonus. Many players have reported huge wins during the Titans of the Sun free spins with at least one report of a player hitting a 3000-unit jackpot from a two-unit bet. The wild symbol is depicted by the Titans of the Sun logo and five in a row will win a massive 5000 credits. Overall Titans of the Sun Hyperion and Theia provides a mythological treat taking you back in time on an adventure of epic proportions. Titans of the Sun was released by Microgaming, meaning you will find it at casinos powered by this software company. While it was a popular release when it came out you will no longer find it front and centre. You more than likely will have to use a casino’s search function to find it. As of 2018 we do not know of any promotions surrounding this game, with more focus going on newer titles.